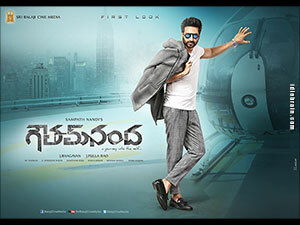 iDream media in association with Colours Media Entertainments are proud to announce the complete overseas rights of Macho action hero Gopichand's Gautham Nanda. Directed by hat trick director Sampath Nandi, Gautham Nanda is a stylish action commercial flick made on high technical standards and top notch production values has Hansika Motwani, Catherine as heroines. The movie is produced by Producers J Bhagawan and J Pulla Rao of Sri Balaji Cine Media banner. Sampath Nandi has presented Gopichand in an unseen look with powerful characterization. Gopichand's upcoming film Gautam Nanda theatrical trailer is out. The Striking element about the trailer is its stunningly grand visuals. The trailer looks as grand and rich as any super star's film. Producers Bhagavan and Pulla Rao didn't compromise on the quality and the result is a visual treat. Even the plot and theme of Gautam Nanda seems interesting. Thaman's background score is in tune with the visuals. The editor did a fine job that trailer will definitely rise expectations. Gautam Nanda is gearing up for release on July 28. We feel very glad and sincerely thank producers J Bhagawan, J Pulla Rao and Samptha Nandi for giving the oppurtunity in distributing the movie across the world.